When I go to my keychain, it shows "This root certificate is not trusted" for this cert. Why is this and how can it be fixed? What do you mean by “my keychain”. 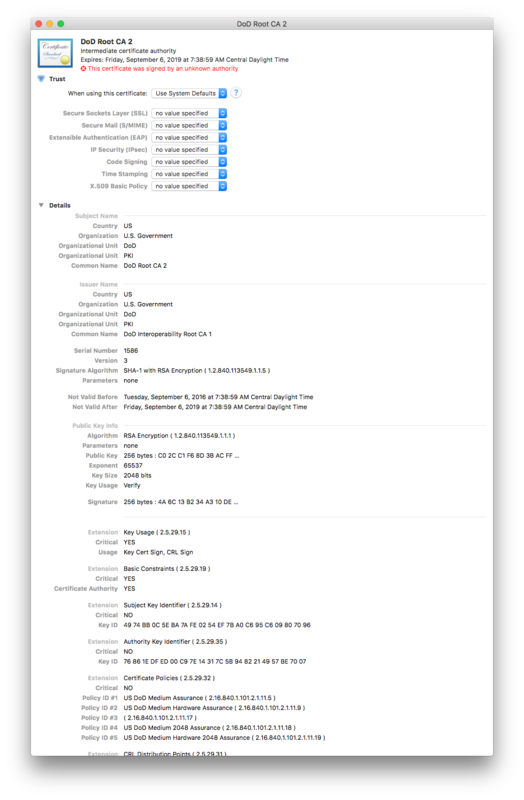 When I open Keychain Utility in a vanilla macOS 10.12, I see the DoD Root CA 2 listed in the System Roots keychain, and flagged as trusted there. The "DoD Root CA 2" has a red X and says "This root certificate is not trusted". Why it says that it is not trusted? What do I need to do to get the "trusted" version back? What shows up in the Keychain column for that item? The latest one I downloaded & installed from a DoD site. So, they are either not signed by a known authority, or they are untrusted. I really appreciate your help and hope that I can get this issue completely resolved. So, I now have 3 of the DOD Root CA-2 certificates in my keychain. Alas, you didn’t answer my earlier question: what shows up in the Keychain column for these items? Yeah, something weird is going on here. 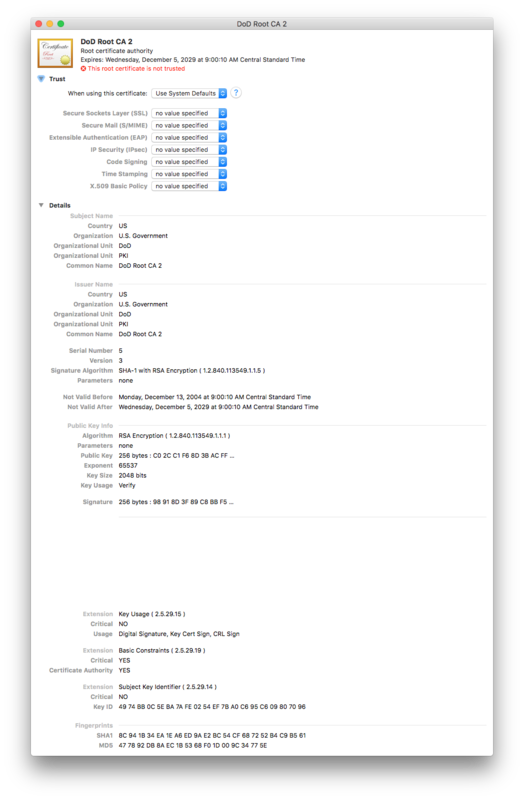 On a freshly installed macOS 10.12 machine here in my office the DoD Root CA 2 root certificate is in the System Roots keychain, where is where you’d expect to find built-in root certificates, and it’s marked as trusted. However, my day-to-day work machine is showing exactly the same state as you’re seeing: DoD Root CA 2 is in the login keychain and is thus untrusted. I suspect that there’s something broken in how the system roots are handled during an OS upgrade. You should file a bug about this; please post your bug number, just for the record. You should be able to work around this by dragging the DoD Root CA 2 to your System (not System Roots) keychain and then marking it as trusted, just like you’d trust any other root certificate. Did you ever get this resolved? It's 2017 and I have this issue. I have one DoD cert that's not trusted and two unverified; what do I do to resolve this? I have a related question and in could this be the reason I can't send an encrypted e-mail to a DoD authority (lock in grayed out in mail)? It seems like the certificate isn't assocaited to the address (contact).